On May 3, 1975, Serling suffered a minor heart attack and was hospitalized. He spent two weeks at Tompkins County Community Hospital before being released. A second heart attack two weeks later forced doctors to agree that open-heart surgery, though considered risky at the time, was in order. 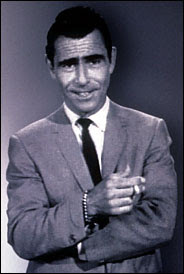 The 10-hour-long procedure was carried out on June 26, but Serling suffered a heart attack on the operating table and died two days later at Strong Memorial Hospital in Rochester, New York. –From “A Game Of Pool,” written by George Clayton Johnson, aired on The Twilight Zone, October 31, 1961. — Rod Serling, The Twilight Zone, Introduction. Thanks for the re-blog, Hella. Yes, he was way ahead of his time and died too young. Hella,Rod Serling was a personal favorite – his was the only show I used to watch.I’ve had students opine that I’m in reality a frustrated actor, but I respond that if I were an actor, I’d be a frustrated showman lecturer because I’d be all the time wishing that I could freely go ‘off-script’ when the impulse arose. Haven’t seen you for a while. How are you doing?